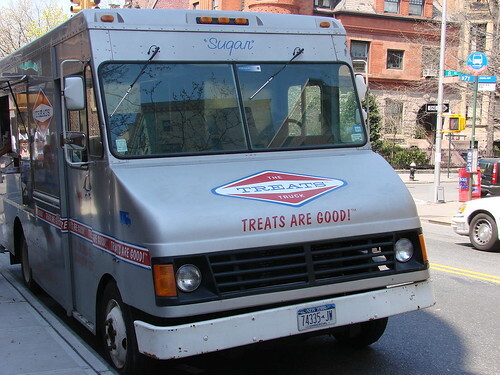 Blondie and Brownie: It's Almost The Treats Truck's Birthday! The party will be held at The Treats Truck Stop--which with its windowed kitchen, selection of children’s books to read and toy stove in the back, not to mention the frost-your-own cookie plates, would be a perfect spot for any five year old’s birthday. Naturally Sugar will be in attendance and according to Kim she’s planning to have Sugar parked right outside so little kids (and big kids) can get their picture "driving" Sugar. The shop is open from 8am until 10pm. Sugar will be there from noon to 6pm, but the celebration should be in full swing from 2pm-4pm. Stop by a 2pm to sing Happy Birthday to Sugar and share in his cake. Kim promises to have some other fun surprises up her sleeve. 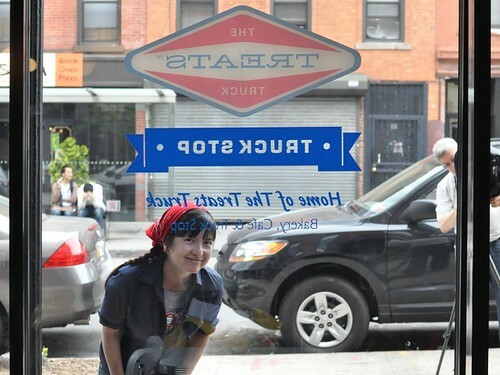 WOW does this place sound cool! Never heard of it before, but CAN'T WAIT to check it out! Frosted cookie plates? ARE YOU FOR REAL?! That is AWESOME!